The mostly unrecognised region consisting of territory in Jordan, Saudi Arabia, Turkey and Israel/Palestinia and all of Syria, Iraq, Lebanon and Kuwait. Credits for the base map go to Google and for the region boundary go to wikipedia. 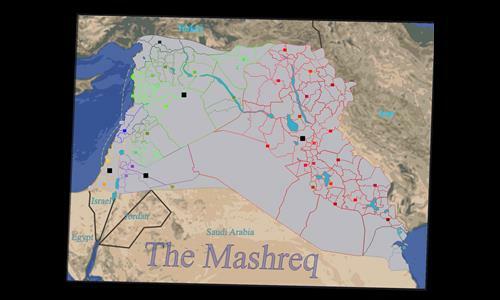 Alternate spellings for the region are 'Mashriq' and 'Mashrek'. Review by zxctycxz [Ollie Bye] on 7/8/2016. As expected, a well-balanced map with good art and nice territory design. Great job! Review by NinjaNic on 7/9/2016. Nice map! Some of the territories are a bit over powered, but I like the use of the background image! Good job. So I have to say one thing territories separated by another territory confuses the flow of any map, disconnection by rivers flowing through them or mountains etc. is one thing but separation by territories I feel is dumb. Otherwise I thought is was a fine map.